Gadag city has one of the tallest statues of Karnataka- a 116 feet tall bronze-finish edifice of XII Century social reformer Basaveshwara. The statue stands next to the city's largest water body Bhishma Kere. This memorial, a government project, was started in 2009 and completed in 2015. 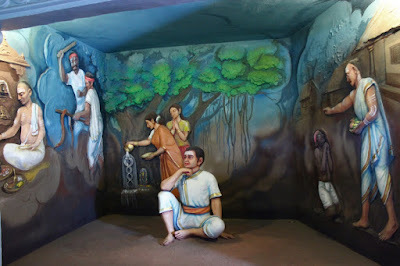 Around the statue is a simple garden and in its base is a small museum showing some important events from Basaveshwara's life. 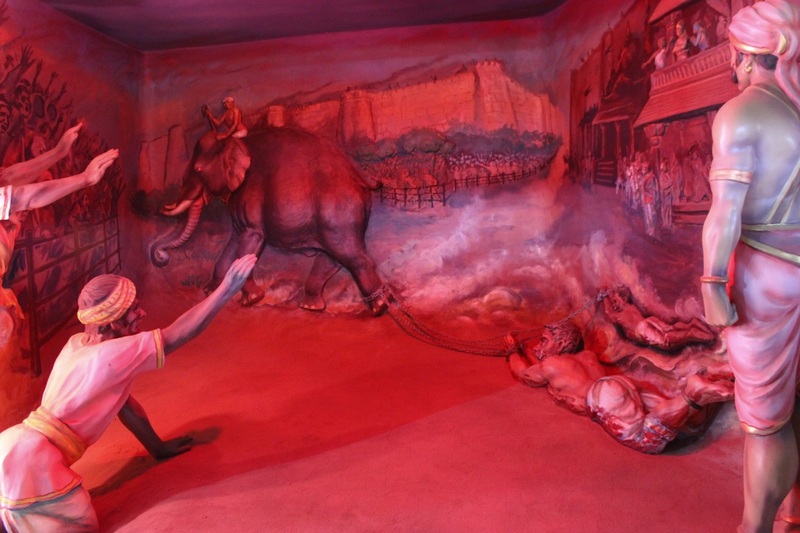 The events are depicted using life-size statues and wall paintings. Here we go on a photo-tour of the museum at Basaveshwara Memorial. A son is born to a pious Brahmin couple Madarasa and Madalambike of Bagewadi, a village in the present day Bijapur District of Karnataka State. The couple were regular visitors to Sangameshwara temple at Kudala Sangama, the confluence of rivers Krishna and Malaprabha. Once when Madalambike was meditating, she visualizes a scene of Nandi entering her womb; when Madarasa hears of it, he feels that Basava (Nandi) will be born to them as a son. The new born infant remains silent for days; the worried parents fearing their child to be deaf and mute. Jatadeva Muni, an ascetic, happens to visit the family and hears about the infant. Jatadeva whispers "Om Namah Shivaya" into the infant's ears; the infant responds by opening its eyes. Jatadeva confirm their child is neither deaf nor mute but he was deep in meditation. 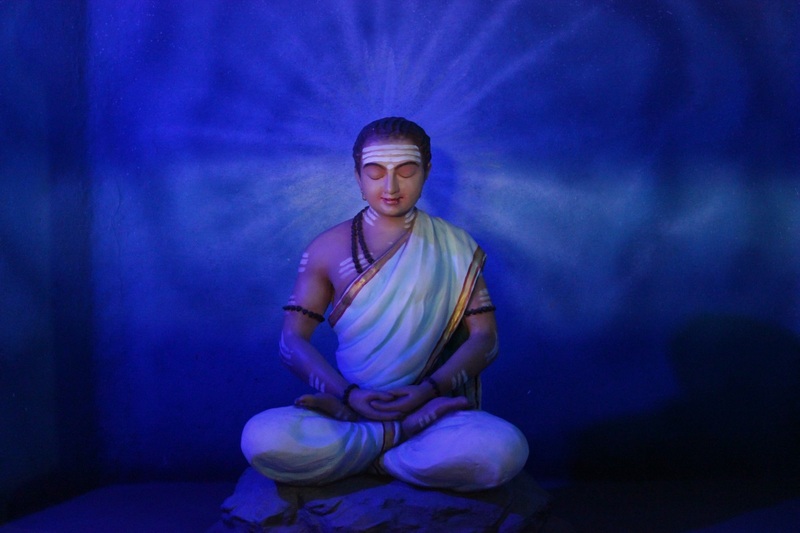 On the ascetic's suggestion, the infant was named as Basaveshwara. Basaveshwara's thoughts as a young boy were different from boys of his age. He was kind to people and animals alike. He noticed the contradicting behavior of people.. they would worship stone images of serpents but when a real serpent was seen, it was killed. He was disturbed by treatment meted to low caste people. Basaveshwara questioned if people were born equal so why the differences.. why were they not allowed into the temples or use well water ot live decently like the upper caste people. 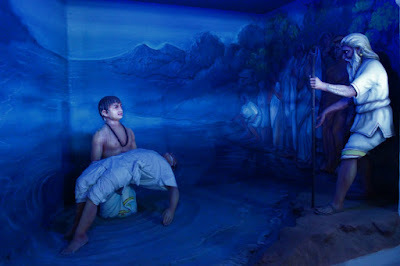 Basaveshwara rescues a friend from drowning in river Krishna. 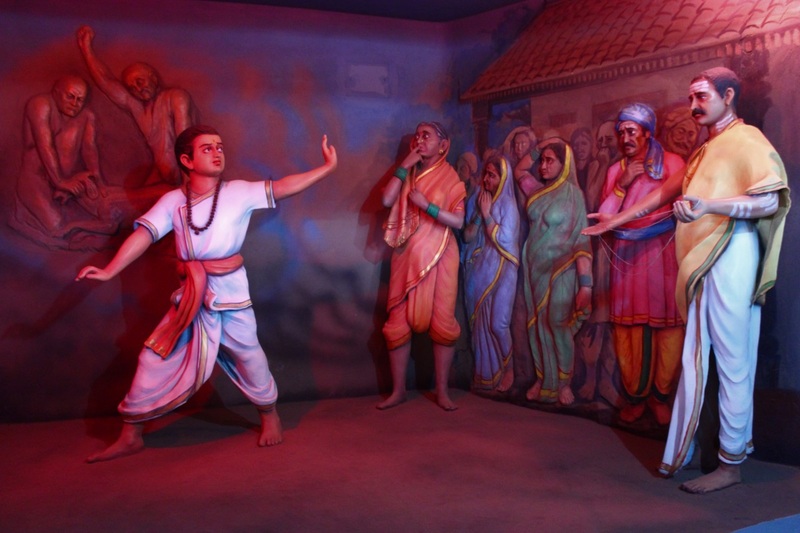 Though soft at heart Basaveshwara was brave and had the courage to help people in danger. Basaveshwara shunning the age old practices. He rejects the Upanayana ceremony, against the wishes of the community. 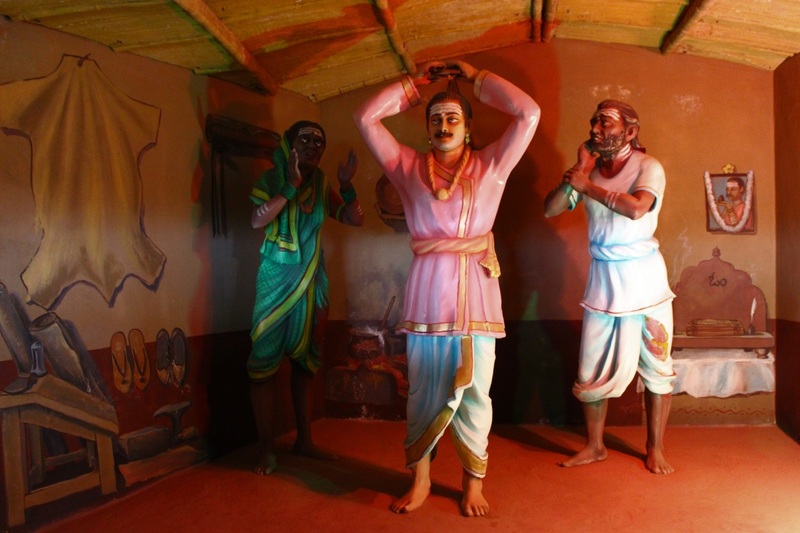 Basava moves from Bagewadi to Kudala Sangama where he joins the Gurukula and gains education. Basaveshwara as a young man meditating at Kudala Sangama. Basaveshwara wanted to remain a bachelor however on his Guru's advice he enters family life. Basaveshwara marries Gangambike, daughter of Baladeva, a minister in King Bijjala's court in Mangalawad. 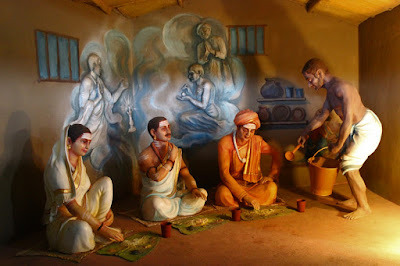 Baladeva is well off and expects his daughter and son-in-law to live a easy life but Basaveshwara decides to move out and earn his own livelihood. 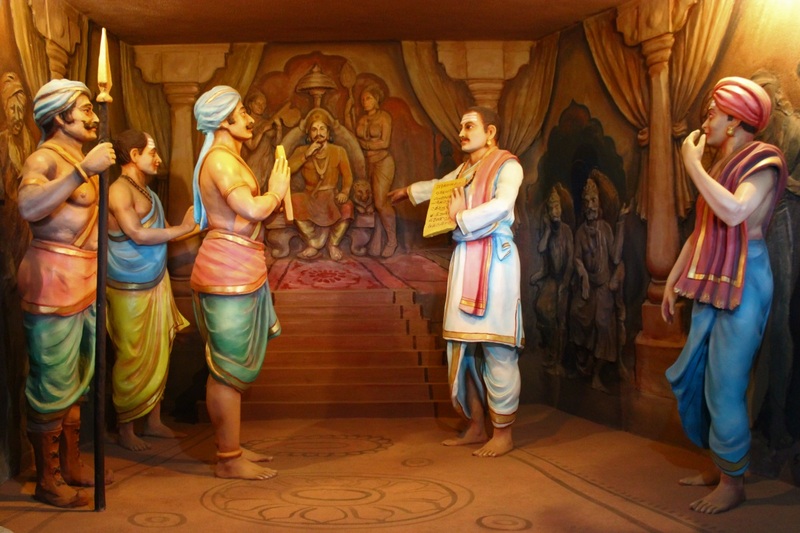 On Baladeva's recommendation, Basaveshwara gets the job of an accountant at King Bijjala's treasury. Later Basaveshwara marries Gangambike's sister Neelambike too. 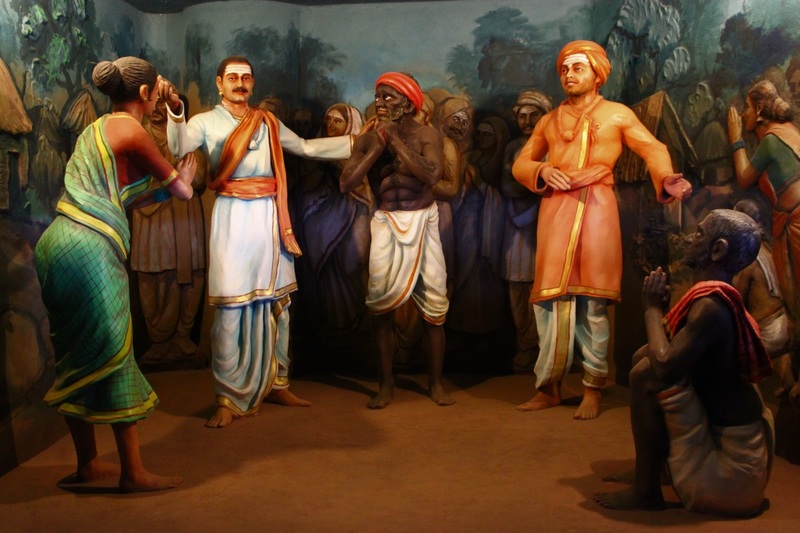 Basaveshwara's honesty and sincerity impresses King Bijjala and gains his trust. A copper plate inscription is discovered in the king's palace however nobody is able to read the script. King Bijjala calls for Basaveshwara's help; with the help of a mirror the script is deciphered. The script was from Chalukyan emperor Vikramaditya's time; it reveals a treasure buried under the throne. Though many courtiers were against the idea of moving the throne, the king decides to check out the truth of the inscription. On digging up the palace floor, a treasure was found which was placed at Basava's disposal. Basaveshwara utilizes the funds for improving wells, lakes, tanks and roads of the kingdom. At this point, a group of courtiers are bitter and jealous about his growing popularity. Eventually he is promoted to the post of a minister. 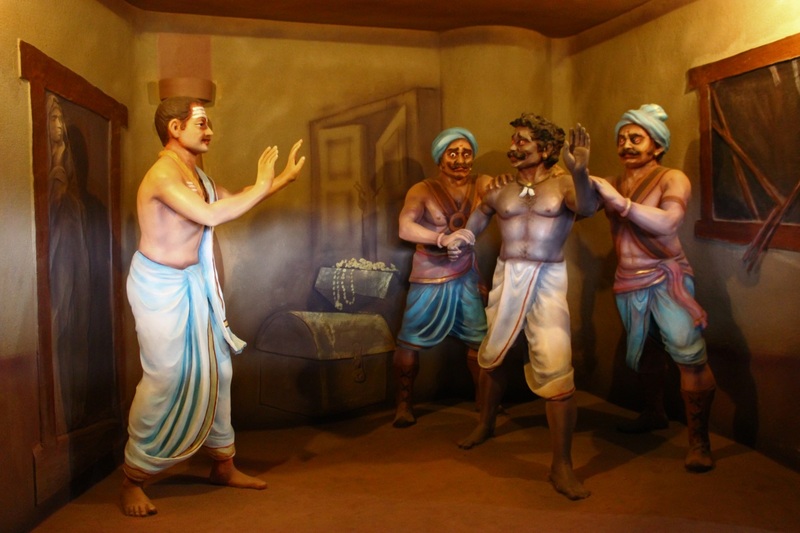 One night, a thief entered Basaveshwara's house. Hearing some noise Gangambike got up shouting, “thief, thief.” which woke up Basaveshwara. The thief froze in fear and fell at Basaveshwara's feet. 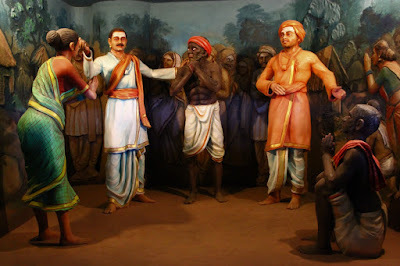 To the thief's surprise, Basaveshwara lifted him up and he asked Gangambike to bring some more valuables who raised an objection to which Basava replied “His need is greater than ours, so give them.” The thief begged for pardon and vowed never to steal again. It was Basaveshwara's way of transforming people with love. Basaveshwara dining with wife Gangambike and nephew Channabasaveshwara. In the background is a scene showing Sharanas performing pooja to Ishta Linga. The word Sharana means one who has surrendered to Lord Shiva. Sharana's believed in complete surrender to the Lord. Basaveshwara and Channabasaveshwara with low caste people who were treated as untouchables. Basaveshwara wanted to transform their lives; he advised them to maintain cleanliness of the body, home and surroundings. He made them give up evil habits and lead pious lives; taught them to worship the soul within. 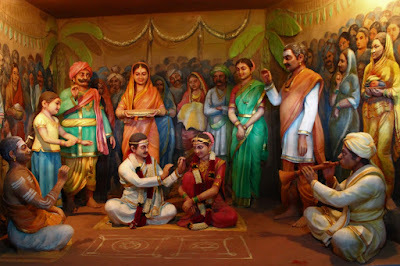 This scene depicts the story of Haralayya and Kalyanamma, a tanner couple who lived in Kalyana. 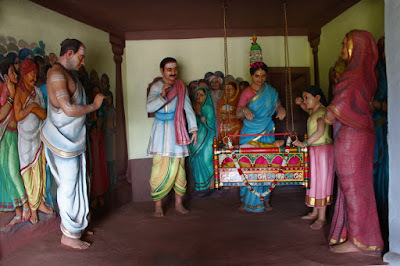 Haralayya and his wife Kalyanamma were part of the Sharana movement. During one of the Sharana gatherings it so happened that Haralayya greeted Basvanna formally saying “Sharanu” to which Basavanna responded by saying “Sharanu Sharanarthi.” Haralayya was awestruck by Basava's courteous greeting. 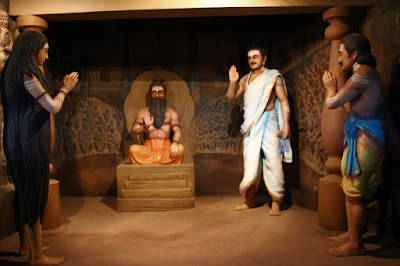 Haralayya felt that he had committed a grave sin because he had let a great soul like Basava had respected lowly person. To free himself of the sin Haralayya decided to make a pair of slippers from his own skin. Haralayya\s wife Kalyanamma said she had equal right in the deed and she too decided to give join the act. The couple cut off skin from their thighs, tanned and made pair of shoes befitting a minister. When the shoes were presented to Basava, he was awestruck, touched them to his eyes and placed them his head. Basava said the shoes had divinity in them, he could never even think of wearing them and returned them to the couple. Haralayya's shoes can be seen to this day at Bijjanahalli in Kalburgi district. A conference at Anubhava Mantapa; Basaveshwara, Allamaprahu and Akkamahadevi watched by hundreds of Sharanas. 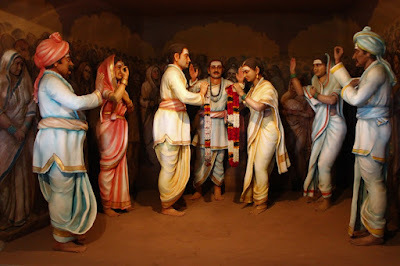 Basaveshwara witnessing the wedding of tanner Haralayya's son and Madhuvarasa's daughter., a Brahman. This marriage irked the upper caste people and was the beginning of serious trouble for Sharanas of Kalyana. The high caste people reported the wedding to the king who ordered Haralayya and Madhuvarasa to be dragged by an elephant on streets. At this point of time, the Sharanas detractors had successfully planted the seeds of doubt in King Bijjala's mind. 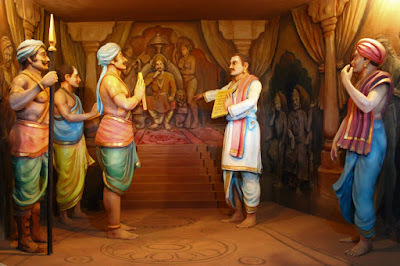 King Bijjala accuses Basaveshwara of financial fraud. 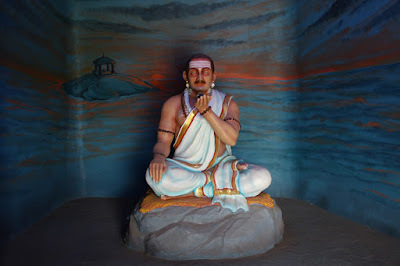 Basaveshwara resigns from his post, leaves Kalyana and shifts to Kudala Sangama where he spends his final years meditating and passes away at the Mantapa which is now called Aikya Mantapa. The high caste people, through King Bijjala start harassing Sharanas. As a result, violence breaks out between the two parties. Eventually King Bijjala is assassinated and the Sharanas are blamed for it. Unable to bear the harassment Sharana's flee from Kalyana; one large party move towards Srisailam while another party led by Akka Nagambike, Gangambike, Channabasaveshwara and Madivala Machayya move southwards pursued by Bijjala's soldiers. The groups clash at Kadrolli near Kittur; Bijjala's soldiers lose the battle. Madivala Machayya is seriously injured and passes away at place near Khanapur in Belgaum district; the village is called Kakkeri. The victorious Sharanas rest at Ulavi Basaveshwara Gudi in Dharwad. Channabasaveshwara attains Samadhi deep in the jungles of Western Ghats, the place is called Ulavi now. Basaveshwara during his last days at Kudala Sangama. Basaveshwara is an idea rather a physical body, it is a movement, it is a phenomena. Basavanendode paapa desekettu odduvadu. Hail Basavaraj from Sahas. True, putting his principles into practice is what is needed. 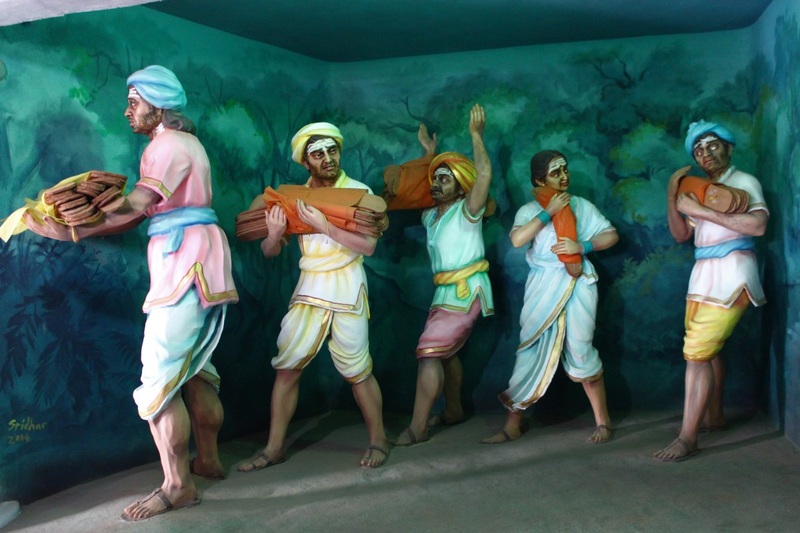 Hoping these scenes create awareness of Basaveshwara's life and his teachings.